You never know when a paying client will want to license a photograph from you by paying an honest-to-goodness fair price. I came across a rare, fun experience recently when a designer from Penguin Random House reached out to me wanting to use one of my pictures for a book cover. 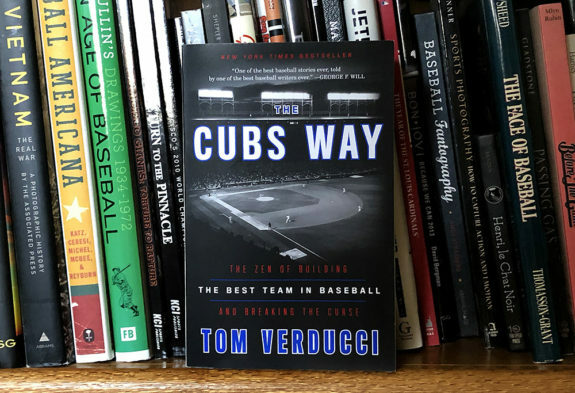 The popular book written by Sports Illustrated baseball writer Tom Verducci about the 2016 World Series Champion Chicago Cubs, The Cubs Way, was being reprinted in paperback. 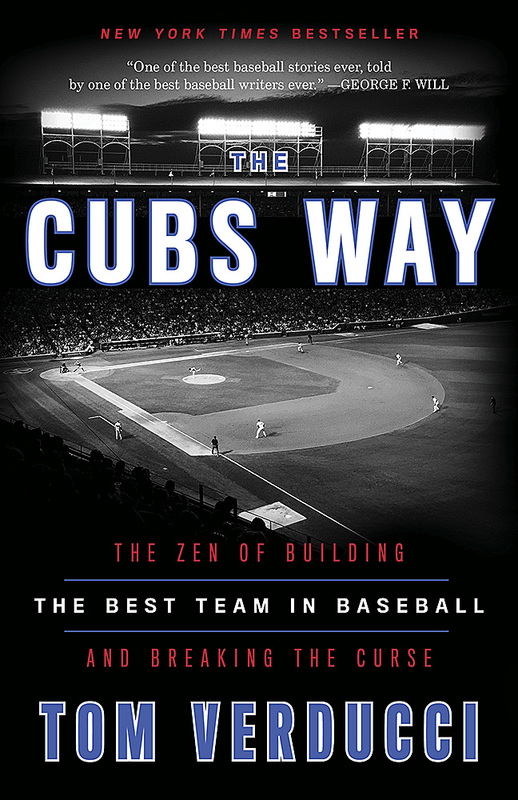 The hardcover sold so well they were coming out with a paperback edition a year later. When this happens publishers usually want a different cover to attract new readers. Luckily for me the designer found my black and white iPhone Instagram I shot of the interior of Wrigley Field at night in 2015 from my blog post I wrote about that trip. I had never been to Wrigley and finally made the trip there in August of 2015 to shoot some games and hang out with my friends the Duffy’s. I shot several games with my 35mm digital SLR’s from the field with a credential, but on the first night of a four-game series, a Thursday, I roamed around both inside and outside the stadium shooting wide stuff. 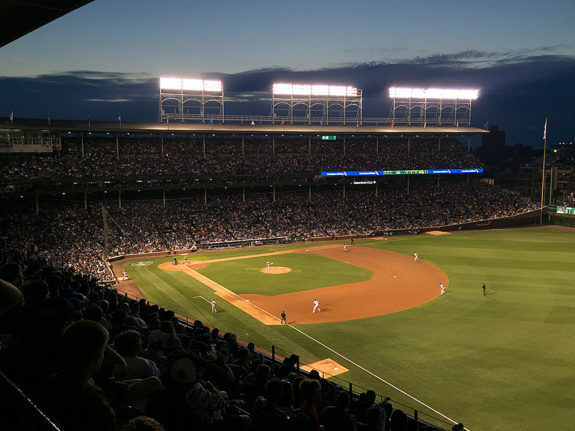 I wanted a great sunset from the upper deck in right field, like the incredible ones I have seen over the years from my good friend and legendary Cubs team photographer Stephen Green. However, when I made my way to the right field corner amongst the reloading station for beer vendors selling case after case of Goose Island beer there was no pretty sunset. No orange sky. Nothing. I still shot with both my Canon and my iPhone but was pretty bummed. 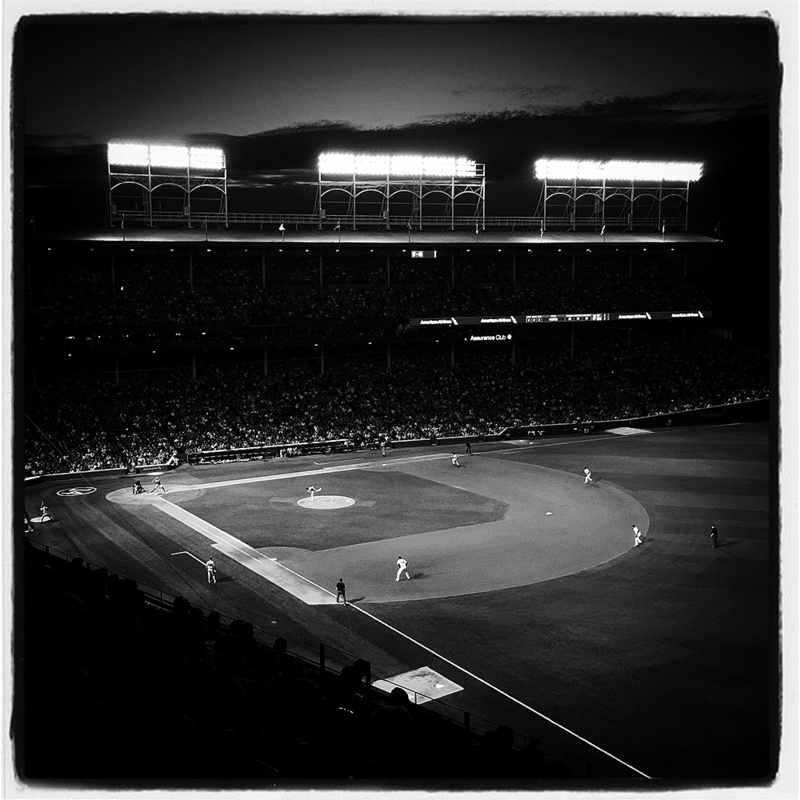 I wanted to send out an Instagram to show everyone I finally made it to Wrigley, but since the color was so bad I converted the one image I liked to black and white in Snapseed, ran it through Lo-Fi in Instagram and sent it out. Little did a know that this one simple image would become a book cover a few years later. It is incredibly cool to know there are designers and publishers out there who still take the time to search out individual photographers for images, instead of going straight to the wires and agencies. It’s also nice to be able to legally license an image for editorial use and be able to keep 100% of the commission! 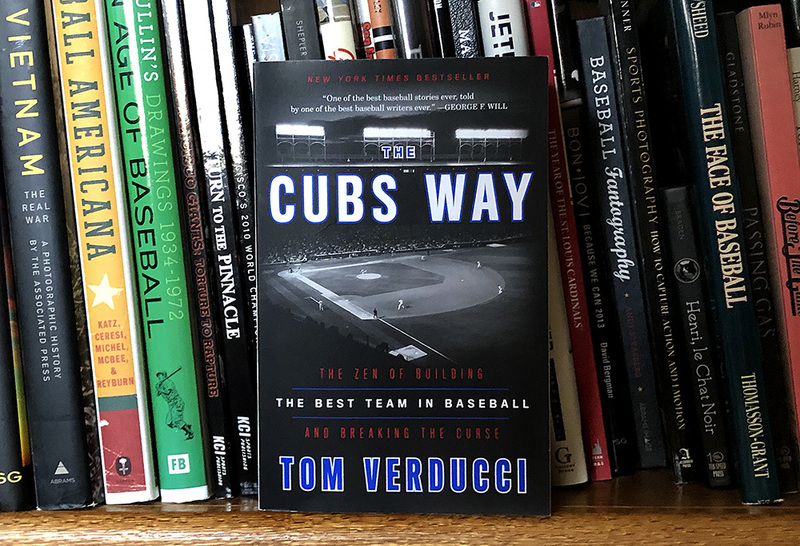 Sure I am just a little biased, but I like my cover better than the original hardcover edition! Brad – Nice going. P-r-e-t-t-y good result from a first visit to this ballpark. And hey, a book cover, a Coke can … sheesh, what a great collection of stories in a very fine career! Thanks Jim! What a magical place Wrigley is!